In preparation for Thailand, we’ve begun to cut back on yeast and grains/sugars. It sounds kind of extreme. It actually feels kind of violent, especially when our kids don’t get cereal for breakfast! To be fair, one reason we decided to do this has been to help address health issues, and it has really worked! But since cereal and milk are not really a “thing” in Thailand, we figured we’d stick with the “no sugar” lifestyle and start living like we’re there as much as possible. I want to share with you some of that adventure in cuisine, so this means a slideshow. But first, I just have to show off the pie I made a couple weeks ago for our “life group” Thanksgiving get-together. This was the last sweet thing that I made and I have to say, I totally killed it! It was a cherry pie made from cherries we’d bought from Sprouts a couple months ago and had frozen. I depitted them myself and made a toned-down filling (not super-sweet and not overly starchy). The dough was of whole-wheat pastry flour, I made it myself, rolled it myself and even did a nice job on pinching the sides. My wife was impressed too! Okay, well, now that this is out of the way, we say goodbye to pies and hello to the life without sugar. So I’m going to show you what we’ll have eaten in a 24 hour period by breakfast tomorrow. We’ll begin with lunch today. I started by attempting to make a pieced-together version of pad gra pao gai from Thailand, minus the rice (because we’ve cut that out temporarily) and the egg (because we ran out yesterday). It is traditionally a chicken/meat and “holy” basil stir-fried dish that you can buy at almost every street vendor in Thailand and it is seriously amazing! I had it twice while I was there. I have to say that I’m impressed with how it turned out. It tasted remarkably similar even with my own additions. 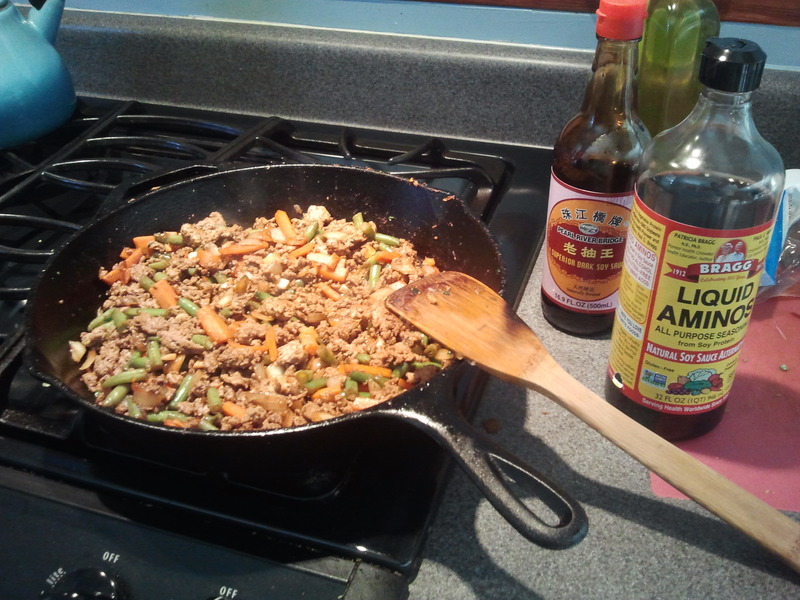 Ingredients: carrot, onion, green bean, garlic, ground turkey, new mexico chili powder, crushed red pepper, soy sauce, dark soy sauce and a squeezed lime to finish. For dinner, Shannon and I went out on a DATE. We’ve been wanting to go to one of those hipster restaurants that are locally sourced, so we tried out Tender Greens in UTC. I had the seared (raw inside) tuna with a butter lettuce salad. 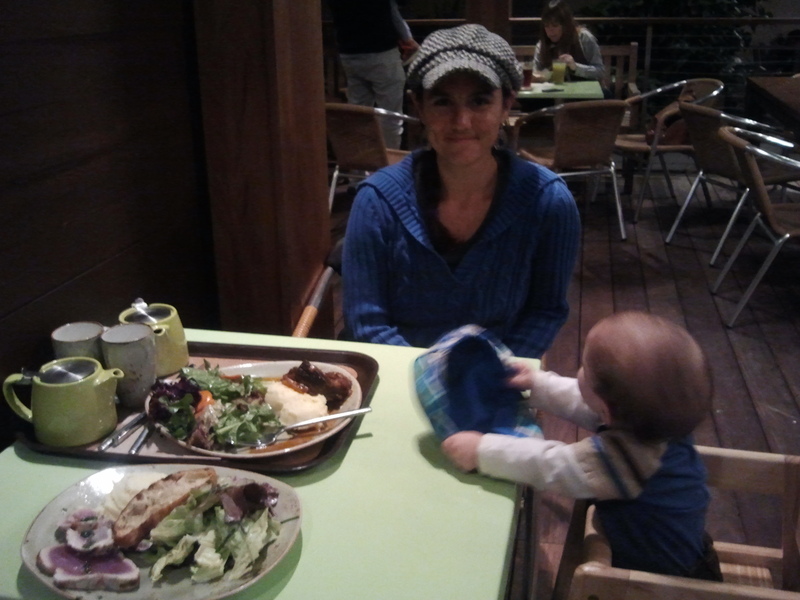 Shannon had the braised beef. Little B had my mashed potatoes and some of our meat since it was soft enough for his toothless gums. 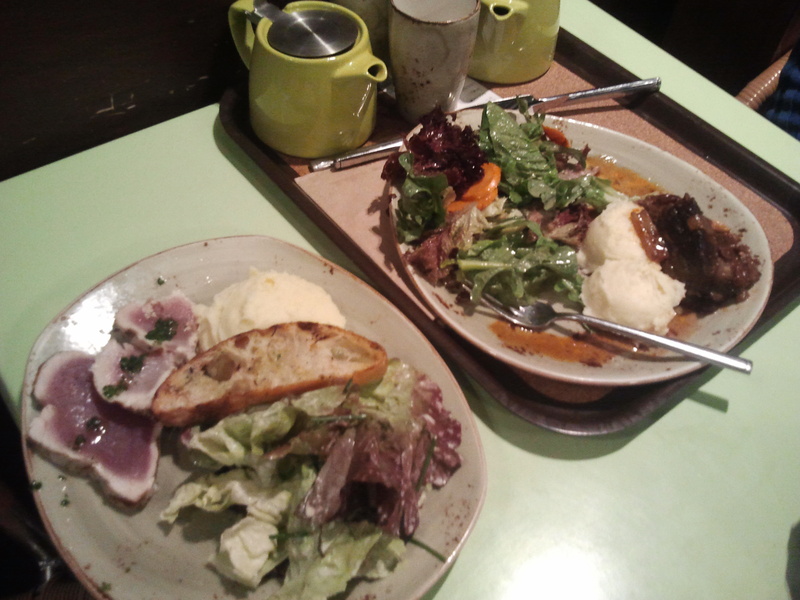 The food was great and the price not too high for fancy and local/organic food. I’d recommend it. And for breakfast…. 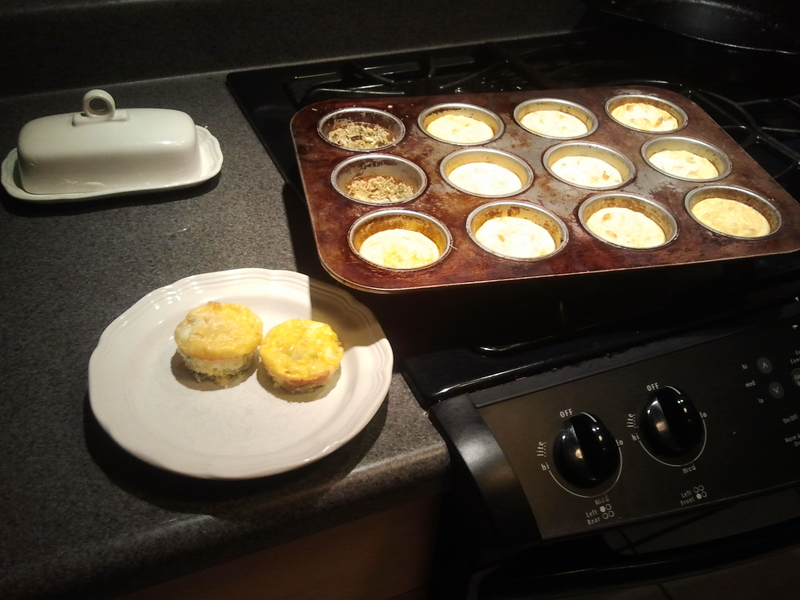 we ju st made some “egg muffins” for tomorrow morning. Special thanks to our friend Lori who posted her own pics and recipe for this on facebook. It was very timely since we’re “scrambling” for ideas of what to eat (pun intended!). Ingredients: sauteed onions and broccoli, parmesean cheese, romano cheese, eggs, yogurt, salt. Very simple, but, hopefully(! ), very tasty. But they will be very easy since now I don’t have to cook tomorrow morning. So now it’s your turn. I know we have a decent amount of readers on this blog. So please post your own favorite non-sugar meals with ingredients list. Remember, the Good Life is one that we do not walk alone. And… I’m still trying to figure out dinner for the next couple of nights (especially if it gives me an idea of what to do with the other half pound of ground turkey in the fridge). This is really awesome! About 2 months ago, I bought an essential oil kit from Young Living and started using my oils for everything. From fevers, to coughs, to scrapes, ear infections, tummy aches, etc. I fell in love the idea that God had created fruits for us to eat and plants for healing (Ezekial 47:12). After redoing my medicine cabinet with these oils, I researched what else I could be using them for, when I came across a detox. I used Lemon to detox toxins from all the bad food I had eaten, Peppermint for energy, and Grapefruit to increase my metabolism. I lost 15 lbs in 2 weeks, felt amazingly healthier than I’d ever felt, had no more sugar cravings, and felt total control over what I put in my body. This is when my healthy journey began. 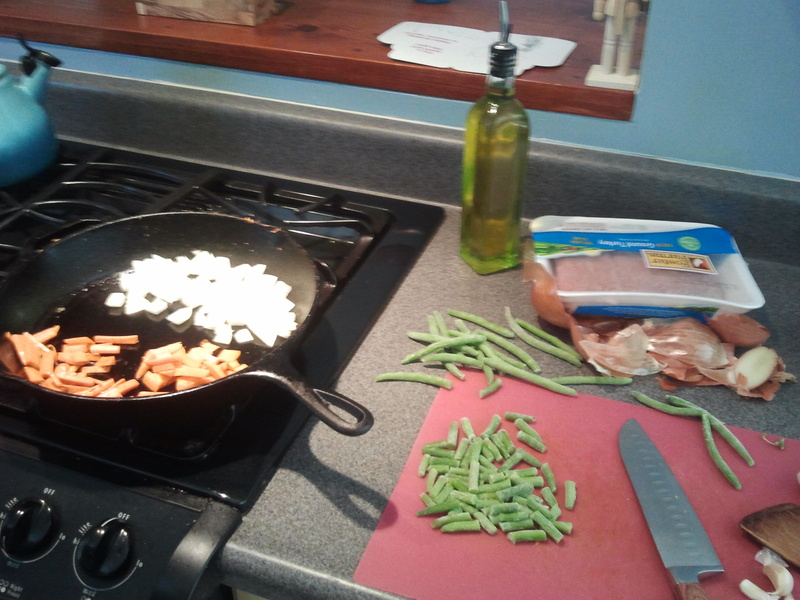 I have been preparing much healthier dishes for my family and have been cutting out a lot for health benefits. My goal is no sugar, no breads, mostly veggies and fruits. For me so far so good, for the kids they enjoy the food but have a hard time letting go of the sweets. With cancer and diabetes on every corner, my main goal was to provide the people that I love the most the best way I know how…a healthy living. So I am determined to press. Lately I have been making a sautéed dish of avocado oil, cauliflower, broccoli, squash, onion, asparagus, hominy, and garlic salt. It taste really yummy and light and the kids love it! For snacks we’ve been eating nuts, nuts and more nuts, lol. The kids enjoy lots of fruits also. Breakfast is a hard one for me…there’s so many eggs we can eat. So I find myself scrambling for breakfast ideas. I do make smoothies, mostly in summer though. Anyways, I love the idea of this blog and look forward to reading new ideas. Hey Darla. Yeah, we’ve been hitting the nuts and fruits quite a bit. My daughter ate some of the egg muffin today and had some of Shannon’s veggie stirfry. Success! Consistency is our greatest asset. But I digress. I’m interested in the essential oils and plan to get some of the basic ones before leaving, like tea tree oil for skin infections. But I hesitate to use them a whole lot until I learn more. My current understanding is that the oils are way more potent outside of their natural “packaging” be it bark, leaves, fruit, etc. Shannon’s acupuncturist explained it like that anyway. At some point, the use of the oils starts to look like western medicines and I would expect that toxicity could occur. But I admit that I do have a lot to learn about the oils. Some of my friends swear by them and I’m eager to learn more about them. Maybe you can teach us since you’re getting into that world? I have also gone on a restricted diet. A significant part of it involves a total removal of sugars and simple carbs, that includes grain, potatoes, and fruits. I’ll tell you what,you could do a lot worse than slow cooked dry beans stored in the fridge and at each meal heat some garlic in butter and salt add some fresh chili throw in some chopped greens (I especially like moringa leaves from the farm) and once they wilt throw in some beans till they heat up in all those flavors then right at the end a dash of pineapple vinegar for a bit of acid. That with an over easy egg and a side of lacto-fermented garlic and ginger carrots and all together you end up with something that is never boring in your mouth. Oh, you can add the turkey to the butter before the greens and then add the greens once the water from the meat steams off.